The advent of advanced color displays brought about a new way to look at images: on-screen slideshows. Rife as Mac OS X already is with slide-show capabilities, PhotoPresenter builds onto those and puts many more options and styles at your fingertips. 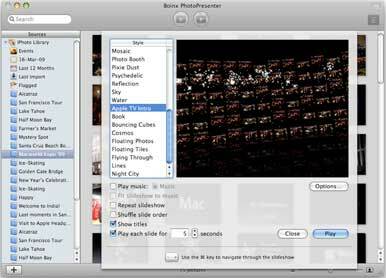 PhotoPresenter has a simple iPhoto-like user interface with a sidebar on the left listing all the albums from your iPhoto library and a viewer on the right displaying thumbnails of your images. The rest of the spartan interface is composed of a search field and just a few useful buttons for playing slide shows and adjusting settings. One of the major draws of PhotoPresenter is the flexibility it offers when creating slide shows. You can choose to play entire albums or events, combine photos from different events, and even drag in photos from the Finder. PhotoPresenter’s plethora of slideshow presentation options makes it much more powerful than the built-in combination of iPhoto, Front Row, and the Finder. The sheer cornucopia of slide-show styles PhotoPresenter features is stunning. From the simpler dissolve, swipe, and Ken Burns effects that enhance the glamour of your photos to the busier options such as Night City and Flying Through that would serve better as a screen saver, PhotoPresenter has them all. It also allows you to export your slide show as a movie in a variety of resolutions and sizes or as a screen saver (though the screen savers aren't as polished and smooth as you'd expect them to be; the screen savers I created have choppy animation and often skipped frames). Although this version of PhotoPresenter is limited to images on your Mac, the upcoming version 4.0 will add support for online sources like Flickr and MobileMe Web galleries, along with several interface refinements and new slide-show effects and transitions. An application dedicated to creating slide shows might not seem like a big deal, but if you've ever enjoyed watching a slide show in iPhoto with your friends and family on a lazy afternoon, you ought to give PhotoPresenter a shot. It just might leave you pleasantly surprised.